The beach is quiet now, almost deserted, with just one or two people paddling in the shallows about 50 yards away from where I am sitting. It wasn’t always the case today. Earlier this morning there were lots of people swimming, paddling, playing about on inflatables of various sizes and descriptions, or just lying around sunning themselves in the hot Dordogne sunshine. Around 6.00 p.m. they virtually all disappeared back to the campsite to prepare the evening meal. They will be back later, however, when the light begins to fade. The children have been gathering driftwood and this evening, as every evening, there will be various small bonfires lit up and down the beach. Various groups of family and friends will bring their chairs and mats and sit around the bonfires toasting marshmallows for the children and sharing a glass or two of wine for the adults. There will be the drone of people chatting quietly interspersed by the sound of sudden laughter as a funny story or experience is shared, or the shriek of excitement as the sparks fly when another log is thrown on a fire. I say ‘beach’ but it is probably not the kind of beach by the seaside that you may be thinking of right now. We are on the final leg of our two month sojourn in France, and we are staying for two weeks at a wonderful campsite at Limeuil (pronounced Lim-oi) in the Dordogne, called Le Port de Limeuil. Our campsite is literally on the banks of the River Dordogne and our pitch (as well as several others) is right by the river overlooking the town. The beach is the shingle beach that runs alongside this part of the river. When we arrived, and were told our pitch bordered the river, we were somewhat shirty about it, but it turned out to be the ‘prize pitch’ that everybody wanted. We can literally sit outside our tent and watch the river flowing by and see people enjoying the beach or bathing in the river. It is a very peaceful and relaxing scene. Limeuil is a lovely little historical town situated at the convergence of two wonderful rivers – the Dordogne and the Vézère. We know both rivers well having visited this region of France several times before. We have both kayaked down the Dordogne, and Julia has kayaked down the Vézère. Although both rivers converge at Limeuil they are very different. The Dordogne is wide and shallow and meanders gently along at a lazy pace. In this region of France it flows past various famous Chateaux and picturesque towns and, for me personally, it is a joy to kayak down. It is normally so shallow that there is absolutely no danger of drowning. The Vézère is rather different. It too has its Chateaux and picturesque towns and villages, but it is also much deeper and faster flowing. Julia prefers the Vézère simply because it is more dangerous and exciting. The two rivers converge about 500 yards upstream of our campsite – with the Vézère flowing into the Dordogne – which means that the normally calm and tranquil stretch of the Dordogne that flows past our campsite is actually quite deceptive. 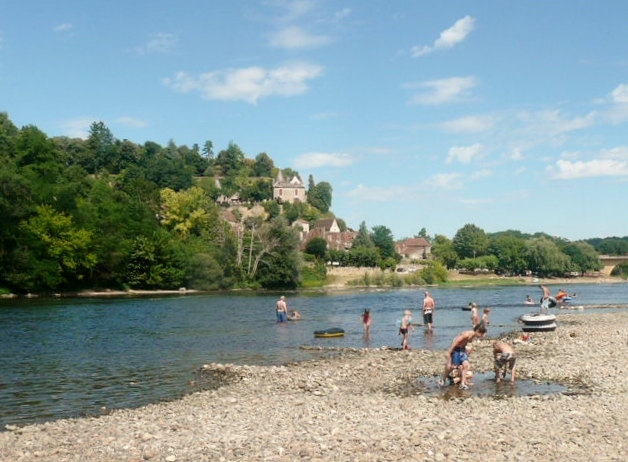 Although the river by our beach is extremely pleasant, with beautiful clear water deep enough to swim in, there is also a very strong current in the middle (as a result of the more powerful Vézère flowing into the Dordogne) that one has to beware of. Just the other day one young man, who thought he was more macho than he actually was, got himself into trouble and had to be pulled out of the current by one of his mates?! We have been to the town of Limeuil before, although we have never actually stayed here until this year. We usually come to Limeuil when we are staying in this part of France because there is an English-speakingChurch that meets here every Sunday in the Église Sainte Catherine at the top of the historic old town . The church is part of the Anglican Chaplaincy of Aquitaine, although in reality its members come from a wide range of Christian churches. France is essentially a secular society – the state owns the vast majority of church buildings – and has a rather hostile reaction to unrecognised religious groups. It therefore makes sense for the majority of English –speaking Protestant Christians to work under the umbrella of the Anglican Chaplaincy. The Anglican Chaplaincy network is very vibrant, and growing, and we have always benefitted from our visits to the church at Sainte Catherine’s (and from her sister church that meets in Sainte Nathelène, near Sarlat). Last Sunday was no exception, either, when we enjoyed a well prepared, thoughtful, relevant, spiritually vibrant service that affirmed many of the things we have felt God speaking into our hearts in recent days concerning the future. The Bible tells us that life is like a river. The Apostle John speaks of ‘the river of the water of life flowing from the throne of God’ (Revelation 22:1). John is not thinking here simply of the gift of life itself – the gift we all possess courtesy of the common grace of God which breathes life into every living soul and sustains that life from day to day – but also of the gift of spiritual life that comes to us through the special grace of God found in the person and work of God’s Son, Jesus Christ. Sitting on our pitch, looking at the river and our beach, reflecting on ‘the river of the water of life’, it seems to me that there are number of helpful lessons to be found here. Life for all of us – even the Christian life – can be just like the River Dordogne here at Limeuil. One minute everything is going ‘swimmingly’ – life is flowing along nicely and everything is tranquil, pleasant, untroubled – and then suddenly you find yourself caught up in an undercurrent you didn’t know was there that sweeps you off your feet and sends you spiralling out of control in a direction that you hadn’t anticipated. Or perhaps you were actually aware of the lurking danger but either ignored its proximity or thought you were macho enough to cope. Apparently the young man that got into trouble, that I mentioned earlier, had lost a shoe whilst swimming and had attempted to retrieve it. As he said to Julia later, ‘I found my shoe, but nearly lost my life in the process! ?’ He was not to know that in fact the vicious current at this point in the Dordogne in fact peters out about 100 yards further downstream, and that if he had just ‘gone with the flow’ he would actually have come out all right in the end. And fortunately for us, life’s undercurrents do not usually last for ever – they usually ‘peter out’ eventually. Having said all that, I am still of the opinion that the best and safest place to be is in the centre-stream of God’s will – he alone knows what is best for us, and he always has our best interests at heart. As he tell us in the Book of Jeremiah – ‘I have plans for you – plans for good and not for evil – plans to bring you hope and a future’ (Jeremiah 29:11). With this in mind, I cannot help but wonder if the convergence of these two great rivers at Limeuil is perhaps an indication that at long last our return to ministry is about to happen. Every campsite we have stayed on during this extended sojourn in France seems to have had a convergence of two rivers nearby. These last three years ‘out of ministry’ has been a time in which we have learned so much, and a time in which God has continued to shape our lives. During this time we have had opportunities to take on other churches … but nothing has seemed right for us so far. We still feel called to some kind of ‘shared ministry’ – can a husband and wife team do anything other – although this time round Julia would be the ‘senior minister’ and I would be there to provide help and support where needed. We remain deeply concerned about the state of the church in the UK, and believe we have something to offer, although it may well be different to what most churches seem to be looking for today. We believe even more passionately – and the service at Sainte Catherine’s last Sunday confirmed this – that there is a church out there that is just right for us, and where we are just right for them. All that is needed is a convergence of the two – them and us?! The beach is beginning to fill up again. The families have finished their evening meal while I have been writing – the children are bringing the drift wood they have collected and their parents are bringing chairs, rugs, glasses and bottles of wine. Most will be going home again in a few days time – their two weeks escape on holiday over for another year. ‘Life’s a beach!’ the escapists say …but we are wiser than that, and we are not escapists. Life – even the Christian life – can be really difficult at times and life’s difficulties have a way of following us even when we try and ‘escape’. What is needed is to find a way of coping with life’s currents. We believe we have found that way in a living relationship with Jesus Christ … and that we are better equipped than ever as a result of our unexpected ‘sabbatical’ of the last three years … and we want to return to ministry to help other people find a way through as well. Choosing to swim in the river may be dangerous … but it is better than simply being washed up on a beach somewhere?! ← GEORGES AND THE DRAGON!